Technology has brought about the ability to view content and data across multiple devices with the flick of a finger. Websites today not only have to play a game of catch up, to be relevant on the latest device, but also need to be readable and navigable on said devices. Menus can be a tricky proposition for websites and applications, especially if you want to show a sizable amount of navigation links. Bootstrap, which is fast becoming one of the most widely used development frameworks, comes with a menu that is built for mobile navigation first. But for those looking for more, Weborithm (that’s us! ), has built a responsive Mega Menu that helps you take your website navigation…up a notch. Ready to go MEGA and responsive? Get the mega menu here! 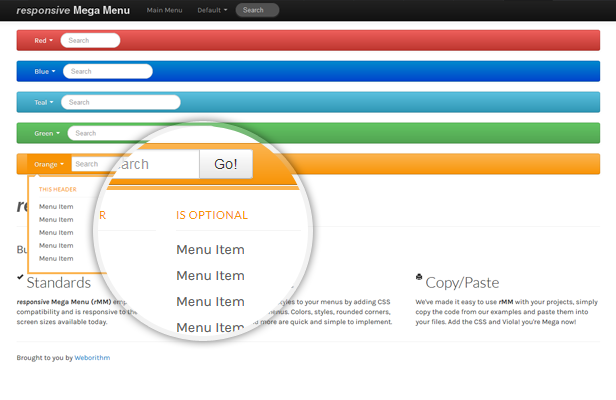 P.S: Did we mention it comes with a color customizer, so you can create your own unique palette for your menu!